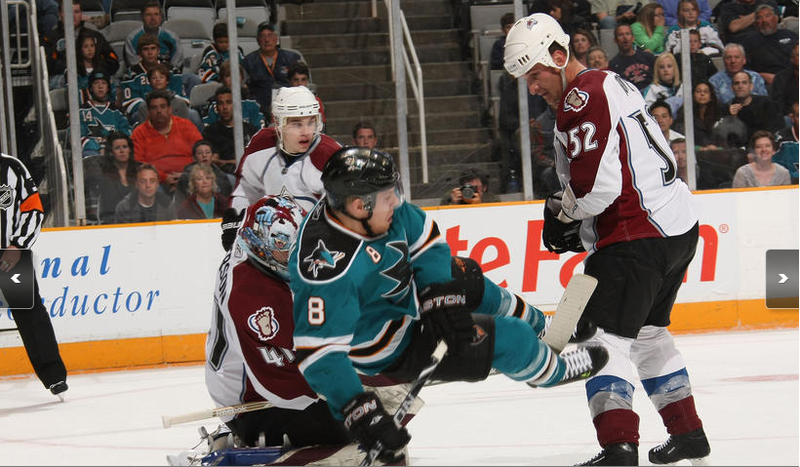 Quite the frustrating game for the Sharks as they fell to the Colorado Avalanche, 5-4 in overtime. The Avs are still battling for a playoff berth and showed that in their intensity throughout the game. It’s really hard to describe the Sharks. I don’t think they played badly, but they weren’t very good either. Things were looking up for San Jose when they scored two goals in the first to take a 2-0 lead. In his first game back from injury, Joe Thornton assisted on the first goal, so there’s no worries about a slump. Colorado got lucky when Kyle Quincey stormed out of the penalty box on a breakaway and beat Evgeni Nabokov, which made it 2-1 Sharks. It was all Avalanche in the second frame. For the second game in a row, the Sharks blew a two-goal lead, and even worse this time was they allowed four straight goals. Joe Sakic-lookalike Peter Mueller scored twice. He’s become one of my more hated players so quickly. Patrick Marleau scored his first goal in 14 road games, and Joe Pavelski knotted it up with five minutes left. I was worried about a letdown after the score was 4-2, and for a moment, the Sharks looked like they gave up. 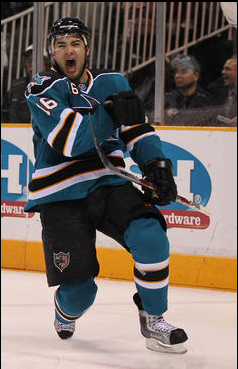 But Marleau’s goal re-energized everyone briefly. Ryane Clowe, who looked like a slightly perturbed bulldog tonight, took a penalty at the very end of regulation to put Colorado on the power play in overtime. That basically did the Sharks in. Even after the power play, Colorado kept the pressure in the offensive zone. They scored to win the game and put themselves two points ahead of Calgary. These last few games are great for the Sharks because they’re all against playoff teams (one potentially)– Calgary, Vancouver and Phoenix. Last year, the Sharks had to sift through bottom dwellers, which got them in the lazy, coasting mood. I do like seeing the goals spread out as of late. Tonight, Douglas Murray and Jamie McGinn had goals along with Marleau and Pavelski. That’s what has to happen come playoff time. Speaking of, the playoffs start in ten days! It’s time to start getting excited and canceling all your late night plans— well maybe gather your friends in front of a TV, hockey fans or not. The Stanley Cup playoffs are the most exciting postseason in sports. Don’t let anyone tell you otherwise. Hit-O-Meter: SJ 16 COL 26; Murray led with five. Colorado outshot the Sharks 40-22. Calgary players won’t be too happy the Sharks lost tonight. The Flames have their chance at San Jose on Tuesday, in Calgary. Quite the Hello! McFly! game for the Sharks as nobody was home, and Dallas beat them handily again 5-1. Adding insult to injury was the mega-terd Steve Ott with a hat trick — yes, a hat trick. How do you let a goon like that score so much? Oh I know, don’t cover him. Just let him frolic to the front of the net and let him receive passes right in front of Nabokov. It’s what the defense did all night. Just when you think they turn a corner, whammo! 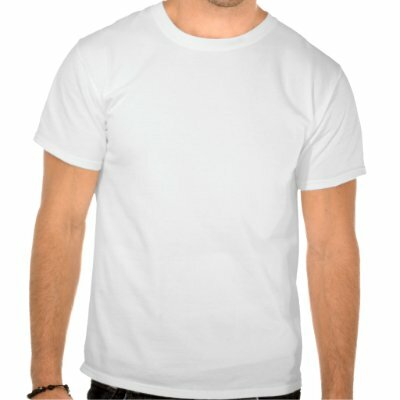 You get hit with this ginormous piece of garbage. Jason Demers played his worst game as a pro tonight. Pairing him with Niclas Wallin was a dumb decision. They teamed up to show us the worst tandem in NHL history — kudos to you guys. Every other defenseman was a turnover machine. It was like watching an infinite loop; you’d see a Shark flail his arms around at the blueline trying to turn around while a Star skated in the other direction. Time after time. No Cyndi Lauper here. If there’s any retired NHL defenseman out there, I’d like to ask how hard is it to mark your man? Is it really that difficult to be between the goal and your man? Actually, don’t bother because I know the answer. It’s about as hard as blinking. The boneheadedness wasn’t limited to the blueliners either. Patrick Marleau caught the syndrome and boy was it ugly. Twice he tried through-the-legs passes and both times they ended up on a Dallas stick on a breakaway. Once led directly to a goal. These turnovers weren’t just coming on 5-on-5’s. Shockingly, they came on power plays. I probably shouldn’t even say shockingly because that would be giving the Sharks credit. How they are third in power play percentage is beyond me. I can tell you they are first in “whoops!” percentage. STEVE FREAKIN’ OTT! Sorry, I just can’t get over this. After the stunt he pulled on Marleau in the last meeting, he was supposed to get payback. Nah, just rewards. Whatever happened to the away-ice advantage in this series? 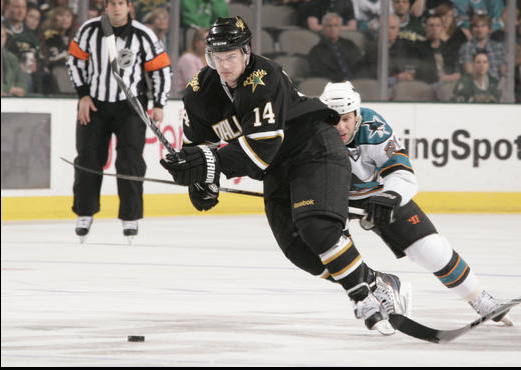 San Jose always won in Dallas and vice versa. That’s gone down the crapper. All the refs ever wanted to call was interference. Seven interference penalties were called. Apparently, the “officials” don’t know what finishing your check is. Demers dropped the gloves with Mark Fistric in the closing seconds. It was a hugfest. I’ve been meaning to mention this, and since I’m already in a bad mood, it’s the perfect timing. Gamecenter and the NHL network really need to stop running these ads. NHLnet already runs the same commercials over and over again, but these ones are so incredibly annoying. It’s hilarious these commercials run on channels and internet software that must be paid for. I think the “everyone” part the NHL is looking for is not going to have enough money to pay to see the ads. Then we get Wayne Simmonds in the ads who looks completely miserable. If you see the ad again, pay attention. Simmonds looks like he just wants to get the hell out of dodge. Great face for this campaign, huh? Hit-O-Meter: SJ 31 DAL 40; Douglas Murray led with six. Marc-Edouard Vlasic didn’t play tonight after re-injuring his leg. Ryane Clowe didn’t return after the first period. Thomas Greiss started the third period. Perhaps it’s a good thing the Sharks play Minnesota on Friday, since they were the team that got the Sharks out of their previous slump. Quite the flatline game for the Sharks are they show no signs of life and lose to the Edmonton Oilers, 5-0. This comes after a 4-3 loss to the Calgary Flames, so as if two losses weren’t bad enough, they were to Alberta. It’s the sixth straight loss, and the loss helps propel the Phoenix Coyotes to first in the Pacific Division. You can say that as many times as you want, but I will never comprehend Phoenix at the top of the standings. They have no great players. It’s that stupid trap system. I’ll go ahead and mention one thing from the Calgary game since I didn’t blog about it. Ryane Clowe decided to fight a “top player” in Jarome Iginla and it was a pretty even match. Other than that, nothing. What makes the loss to Edmonton so mind-boggling is that it was to a goalie, Devan Dubnyk, who was 1-8-2 in the NHL, with a 3.96 GAA and .874 save percentage. The guy had a shutout until three minutes left in the game! Horrific. Unlike in previous games where the Sharks played well for 10-20 minutes, this game had no effort to speak of. Despite Marc-Edouard Vlasic returning from injury after 17 games, and three fights, San Jose failed to come up with good play. 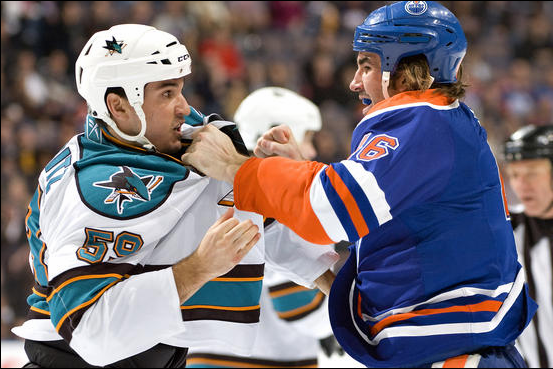 The three fights were all Edmonton victories as well. Brad Staubitz, who has dropped off faster than Mount Roraima, Douglas Murray and Scott Nichol all got pounded. I’ve heard so much hype about Murray and his fighting, but Zack Stortini just annihilated him. Everyone can shut up about him now. He’s a bona fide pylon. Nichol tried his best against Hilary Duff’s beau Mike Comrie, but ultimately got one-punch-KO’d. 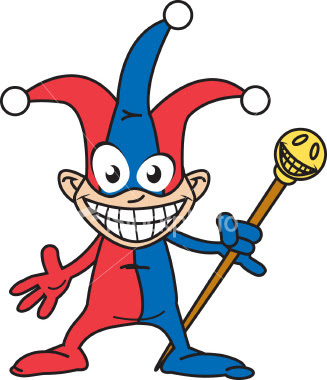 Staubitz is just a jester now. There needs to be one of those movie moments where the coach does something drastic and outlandish to get the team to understand their predicament. Unfortunately, I don’t see it happening. 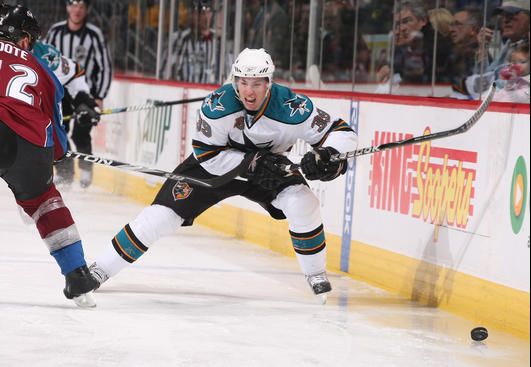 The Sharks will win again this season, but it’s looking like it will be all for not. The first goal of the game came when Joe Thornton turned it over into an Edmonton breakaway. Once the Edmonton guy had the puck, Thornton didn’t bother to chase him; he just peeked back and skated to the bench nonchalantly. Wow. That does it for me. I can’t wait to see him off the team. Worthless. Hit-O-Meter: SJ 30 EDM 19; Staubitz led with five. Next game is Tuesday at Minnesota. Quite the truth-is-out-there game for the Sharks as they showed some effort but ultimately lost to the Vancouver Canucks, 3-2. The “truth” stands for the Sharks’ actual true potential, and it was featured in the third period. Before that, the effort was spotty. After such a nauseating loss and an unplanned practice, you’d think the Sharks would at least come out fierce — nah, too much to ask. 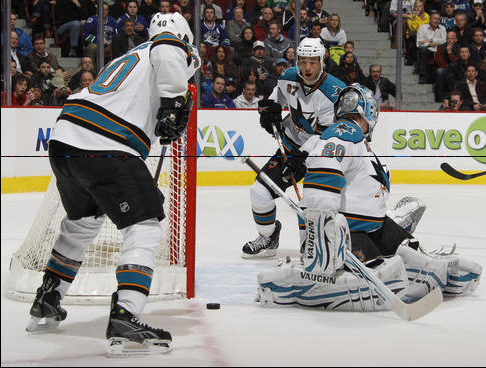 Continuing their horrible play against Dallas, the Sharks allowed Vancouver to score twice in the opening frame. Listen guys, you’re not giving yourselves chances with these bonehead penalties in the first periods of games. This time you took three penalties — that’s 30% of the period in the penalty box. And Vancouver scored on two of those power plays. It’s sickening. Well Clowey, I know. You have a major malfunction in your brain. Stop being a wuss. I realize you don’t want to be perceived as a goon a la Matt Cooke, but you’re supposed to be a top player for San Jose too. And I do recall Joe Thornton and Ryan Getzlaf fighting in the playoffs. With a nose that size, you should be able to fight the world. Next time you face the Stars, I better see you and Morrow tango. Back to the game we go, and the third period showed us what the Sharks can do when they start skating. Relentless forechecking led to a Joe Pavelski goal late in the game. Goalie Roberto Luongo saved the game for the Canucks, literally. A few breaks the other way and this game could be a Sharks victory. But when it rains, it pours. And boy is it coming down. Four straight losses for the men in teal. Playing on a line with Manny Malhotra, these two sped around the ice with authority. I’d say these were the two best Sharks on the ice. Couture got called up for the game finally after tearing up the AHL. He probably won’t be here too long, but I’ll say it again: put him on a line with Joe Thornton! I want to see if they have any chemistry. Of course Thornton isn’t playing great so maybe it’s for the best they stay apart. I’m so sick of hearing “Luuuu” after every save Luongo makes. So annoying. If he isn’t even looking and the puck hits him, the fans will chant it. Enough. Seriously. Hit-O-Meter: SJ14 VAN 17; Jamie McGinn and Douglas Murray led with three. San Jose is back on the ice tomorrow for the second game of the back-to-back. It’ll be against the Flames at Calgary.